Lake Tahoe’s abundant snow begins to melt and the incredible roaring of crystal clear water cascading down rocky granite cliffs echoes into the sky. Breathtaking waterfalls dot the spectacular landscapes of Lake Tahoe’s wilderness, tumbling down into refreshing swimming holes. Lake Tahoe is famous for its beautiful blue lake, however, many are unaware of the rushing waters that roar in the distance. When you are in the area, it is hard to pass up the waterfalls in Tahoe. Lake Tahoe’s most famous falls, the dramatic Eagle Falls, plunge into the iconic Emerald Bay. A great hike for all ages, the trail follows an easy path to the upper and lower falls, both equally breathtaking. Chances are you’ll hear the falls before you witness their beauty. Follow the signs to Vikingsholm to reach the top of Lower Eagle Falls and to truly experience the beauty of the falls, walk to the base via the Vikingsholm trail. The Vikingsholm Castle lies grandly at the bottom of the falls on the edge of Eagle Lake. The perfect place for a picnic and a dip. When the waters are gushing, a wave of mist mingles over the viewing platform. Follow the stone steps to the Upper Eagle Falls to dangle your feet from the wooden bridge as the water roars beneath you. Continue on from Eagle Lake for another 5 miles, an alternative route to the incredible Fontanillis Falls. Getting there: Drive north on Highway 89 from the Highway 50 junction for 8.5 miles to the Eagle Falls Picnic area. Parking also available in the Vikingsholm/Emerald Bay parking lot or along the highway. A fee is required for parking. Alternatively, take the Trolley from South Lake Tahoe! Experienced hikers can head from the trailhead at Bayview Campground into the heart of the Desolation Wilderness on this 12-mile round trip hike to the marvellous Fontanillis Falls, tumbling 150 feet down into Upper Velma Lake. Set out on this trail with lots of elevation change and lots of sun, pass the forested shoreline of Dicks Lake and climb the summit to Maggie’s Peak to reach the shores of Fontanillis Lake. The trail then crosses a bubbling stream to the waters of Fontanillis Falls cascading down a gentle sloping wall of granite, so gentle you can walk next to the rushing waters of this Lake Tahoe waterfall. Plan a full day for this exceptional escape into the wilderness. Getting there: Drive north on Highway 89 (8 miles from South Lake Tahoe, 20 miles from Tahoe City) to the Bayview Campground, just after the paved Emerald Bay lookout parking lot. Drive through the campground to the trailhead. Follow the trail to Desolation Wilderness/Dicks Lake. Head right at the start (left will take you to Cascade Falls). There is an alternate route via the Eagle Falls Trailhead. A free permit is required, available from the Cascade Trailhead kiosk. A simply majestic Lake Tahoe waterfall that drops out of the Desolation Wilderness plunging 200 feet into Cascade Lake, rewarding visitors with some of the best views of Lake Tahoe. One of the best beginner hikes in the area, as well as one of the most popular, the moderate mile-long path along the rocks leads you to the top of the falls that tumble gracefully through the valley adjacent to Emerald Bay and Eagle Falls. Escape into the Desolation Wilderness on this easy hike, dip into the lush shaded swimming holes and soak up the spectacular views. For a little more adventure, hikers can continue on along an unmaintained use trail to the remote Azure and Snow Lakes. Getting there: Drive north on Highway 89 (8 miles from South Lake Tahoe, 20 miles from Tahoe City) to the Bayview Campground, just after the paved Emerald Bay lookout parking lot. Drive through the campground to the trailhead. A free permit is required, available from the Cascade Trailhead kiosk. Head a little off the beaten path to the picture perfect Glen Alpine Falls. Experience an up-close view of the falls from the road without a step! Also known as the Fallen Leaf Lake Falls, these waters just keep giving, they are huge, spectacular and not to be missed. The lower falls are impressive as the waters plummet 60 feet down the layered rocks. A short walk takes you to the bottom lookout point where you can see the sheer magnitude of the falls, or hike up the backside of Mt. Tallac to reach the upper falls, a short one-mile round trip in the scenic Desolation Wilderness. Getting there: Drive north on Highway 89 from the Highway 50 junction for about three miles. Turn left onto Fallen Leaf Lake Road for about 4.8 miles. Turn right at the T, past the marina and left into Road 1216. Parking for the lower falls is along the right side of the road, continue further to the Desolation Wilderness Parking lot for the upper falls. It is a narrow one lane road, take it slow and use the turnouts. Spring brings the big snow run-off to the grand magnificent Horsetail Falls as they tumble down, a torrential chute of water resembling a horse’s tail. As you approach Twin Bridges on Highway 50, you can see this magnificent crashing waterfall to the north. A strenuous one-mile climb over slippery rocks hugging the edge of the falls leads you to Tahoe’s largest waterfall cascading nearly 500 feet. The trail is not always clear, keep the creek to your right and the falls ahead of you and you will get there just fine, keeping an eye out for smaller waterfalls along the way. Despite the short distance, this hike can take a while so allow a half day for a trip from Tahoe. Horsetail is one of the most noble waterfalls in the region, a natural wonder that continues to impress. Getting there: Drive west on Highway 50 towards Twin Bridges. The trailhead is 2 miles east of Strawberry at the Twin Bridges parking lot (fee required). Follow the signs to the wilderness boundary. Free permit required to enter the Desolation Wilderness. Keep an eye out on the road, you can see the falls from the highway. A short hike along the Hawley Grade hiking trail, past the summer vacation homes, brings you to the Upper Truckee Falls. There are no clear signs, but stay left on the trail and follow the sound of the rushing river. This is a short and easy 20-minute round trip hike, best done in spring as the falls fade closer to summer. Getting there: From the junction of Highways 50 and 89 in Meyers, drive west on Highway 50 a short distance, turning left onto South Upper Truckee Road. After 3.7 miles you reach the right turn for the Hawley Grade Recreational Trail. Park here and walk the 0.3-mile to the falls (you may also drive); the main hike is to the right but stay left for the falls and the Upper Truckee River. The picturesque Hot Springs Creek Falls are set in the Grover Hot Springs State Park. This dog-friendly hike is a short and easy one at only 1.7 miles to the falls dropping an impressive 50-feet. This trail can get busy so keep your pooch on a leash and take caution, water can flow rapidly in the spring and summer! Getting there: Drive south on Highway 89 about 13 miles to Pickett’s Junction (the Highway 88/89 intersect). Turn left and follow the signs to Markleeville, turn right on Hot Springs Road and drive 3.5 miles to Grover Hot Springs State Park. The trailhead is past the entrance kiosk on the left just past the campground (fee required). Follow the signs for the Burnside Lake hike, turning left at each junction. The Tahoe Rim Trailhead is the start of this amazing hike to the diminutive McCloud Falls. The hike starts out gently along Ward Creek with great views of the Pacific Crest and Grouse Rock high above. A bridge crosses Ward Creek and the trail steepens winding past fields of lupine, aspen groves and tiny stream beds leading you to the McCloud Falls back-dropped by the impressive Twin Peaks. A must-see if you are on a hiking excursion and looking to see the waterfalls in Tahoe. Getting there: Drive 2.5-miles south on Highway 89 from Tahoe City Tahoe City to Pineland Drive. At the end of Pineland, follow the signs to Ward Valley and Ward Canyon Boulevard. Drive an additional mile to the Tahoe Rim Trailhead on your left. The hike to the falls is about four miles each way. Need a home base for your next Lake Tahoe waterfall adventure? 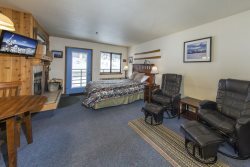 Pyramid Peak Properties offers a large selection of Lake Tahoe vacation rentals that will provide the perfect starting point for your wilderness and waterfall explorations.